Quest Zhu for Nintendo DS 3DS DSi Cart only. Space Chimps for Nintendo DS 3DS DSi - Cart and box only. dagmara-uk has no other items for sale. Explore three game modes that offer varied gameplay designed for a wide range of users. Compete against others with two or four person multiplayer options to claim the title of ARKANOID DS champion. 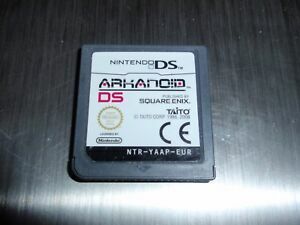 Decorate ARKANOID DS with colorful designs by trading points gained through gameplay for fun backgrounds and icons. Rock to an irresistible soundtrack produced by Zuntata, TAITO?s award-winning sound team. çok sürkleyici, sabır isteyen, eğlenceli bir oyun, tafsiye ederim.